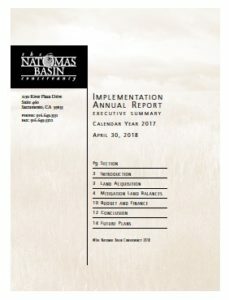 Each year, the Conservancy must file an Implementation Annual Report with the state and federal Wildlife Agencies as well as to all “parties” to the Natomas Basin Habitat Conservation Plan (NBHCP). The Metro Air Park Habitat Conservation Plan is also included in the circulation. The Executive Summary of the Implementation Annual Report capsulizes the more comprehensive and extensive full report. Past year reports are available in the Helpful Documents section under Annual Reports & Audited Financial Statements.